It is always a privilege to be listed with others whose work one admires. I was pointed recently to a page produced by Laura Heap at the London Metropolitan University in May 2014 on their eLearning Matrix pages. On a page where Laura outlines possible answers to the question "What models are there for blended and distance online learning delivery?" she has chosen to include my work here on the SOLE Model alongside some people that I deeply admire. 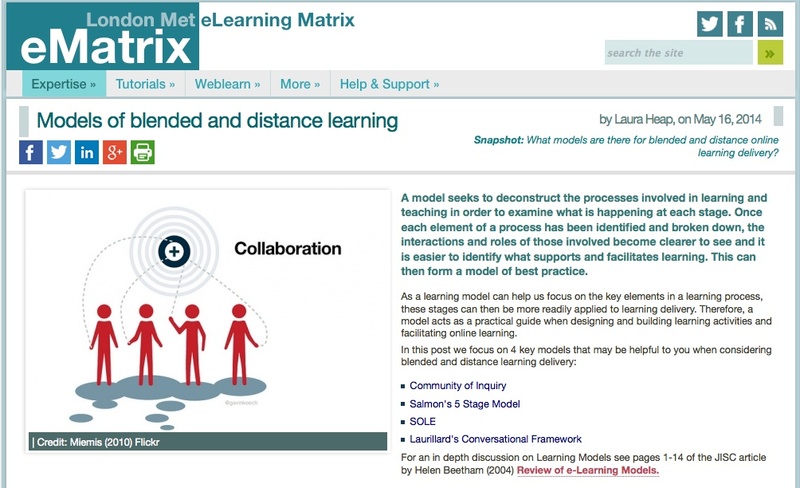 Laura lists four different models (references on the London Met webpage) which each, in very different ways, seek to clarify dimensions of the challenge presented by distance and blended learning scenarios (something I have already written about on my personal blog). Professor Terry Anderson at Athabasca University (Canada), alongside Randy Garrison, whilst at the University of Calgary back in the late 1990s and 2000s, developed a "community of inquiry model" as an instructional design model for e-learning. It seeks to acknowledge the impact of the mutual interdependence of student and teacher through three overlapping 'domains' of the social presence, cognitive presence and the teaching presence. Her second inclusion is the '5 stage model' originated by Professor Gilly Salmon, now at Swinburne University (Australia). This model, from memory, originated from Gilly's PhD work at the Open University Business School in the early 1990s and I have been a critic of its simplistic adoption by many others. The original premise was similar to that of Anderson and Garrison's work that learners needed to be socialised into a learning 'community' in order to operate as effective learners. Originally somewhat limited by the world of CMC (Computer Mediated Conferencing) this model has been extended by others. Laura Heap's fourth 'model' (I'm third so will come back to that) is by Professor Diana Laurillard, now at the the Institute of Education (London) referred to as the 'Conversational Framework'. This work also dates from Diana's time at the Open University late 1990s and early 2000s and has been adapted and developed by a great many others since. Essentially I would describe it as a reinterpretation of dialogic learning, notably in its form advocated by Mikhail Bakhtin (Bakhtin, 1981) who argued that meaning is a co-construction that results in processes of reflection, dialogue, between people. Laurillard builds a simple model that encourages teachers to structure, and plan, that dialogue into their teaching design. The inclusion of the SOLE Model is flattering and does fit rather well. I tried to incorporate meta-theory into the development of a toolkit which would support learning designers and teachers to create 'communities of inquiry' whilst recognising the 'social' dimension and the the cultural differences which students live through every day. Borrowing particularly from Professor John Biggs's work on the SOLO taxonomy (Biggs and Collis, 1982). I also sought to encourage , after Bakhatin and Laurillard, to embed a conversation between the learner, learning activity and the learning objectives. 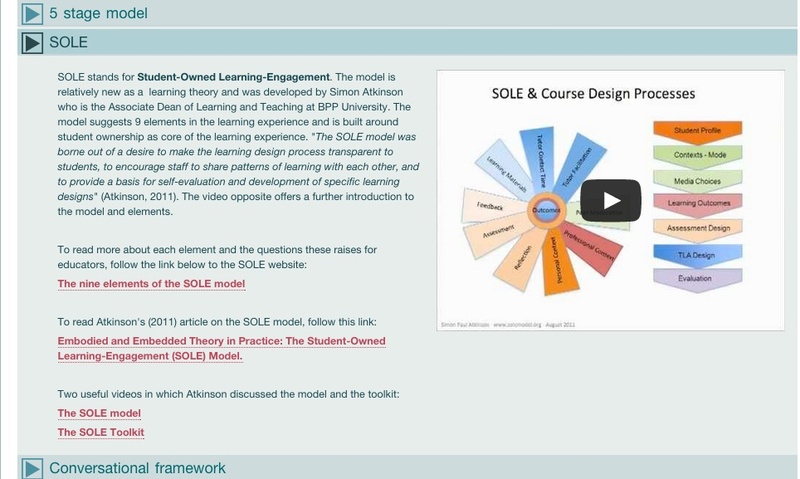 What is clear is that to have a theoretical framework for effective on-line learning design is essential. I may have deviated from Anderson and Garrison's separation from the social and cognitive processes, and from Salmon's stress for human socialisation but the SOLE Model does allow for the personal, communitarian and societal dimension to learning. In fact I see the principle difference is the focus on the student's immediate 'campus' environment and to place a greater stress on the student's real and diverse life 'outside' the control of the learning provider. I also differ from Laurillard's sequenced activity designs that result from the conversational framework into a more 'freeform' learning design at the theoretical level, but the toolkit development will hopefully include further structural aspects in the near future. Learning and teaching online (distance or 'blended') presents unique challenges for teachers and students alike. Personally I advocate transparency to design for the student by sharing the design as an advanced organiser (SOLE Toolkit) in order to express clarity of the learning process (dialogue) and to encourage interaction and feedback leading to enhancement. Whichever way you look at it, it is privilege to find the SOLE Model included in such illustrious company. Bakhtin, M. (1981). The dialogic imagination: Four essays. Austin: University of Texas Press. Biggs, J., & Collis, K. F. (1982). Evaluating the Quality of Learning: Structure of the Observed Learning Outcome Taxonomy. New York: Academic Press Inc.